I couldn’t sleep well. I was turning and tossing in the small bed, still dressed with yesterday’s clothes. Even the two thick blankets couldn’t help me feel just a tiny bit warmer. Such irony, just few hours ago I was desperately wishing for a cooler breeze. The only thing I could think of now, was how freezing it was. The sunrise came with the promise of new adventures and the beginnings of a lifelong memories. The air was fresh and I felt the cold morning breeze brushing my cheeks, as I was holding a hot cup of freshly prepared tea. 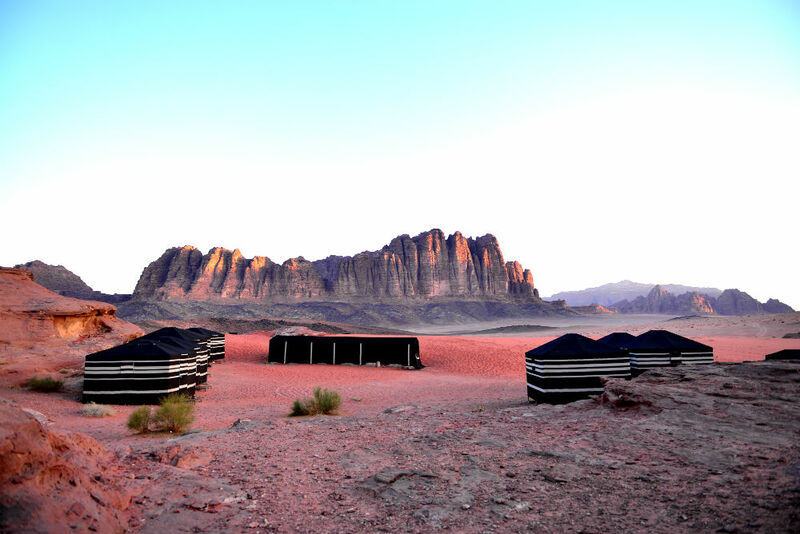 Over the horizon I could see the tops of other small tents and the light brown hues of one of the most famous hills in the world, those of Petra. The breakfast was quickly over and we were on the road again. As if it wasn’t enough that we had just spent 12 hours in a plane, accompanied by another 2 hours of driving and 5 hours of walking just to be able to experience the tiring, but rewarding walk along the paved streets of the ancient city. 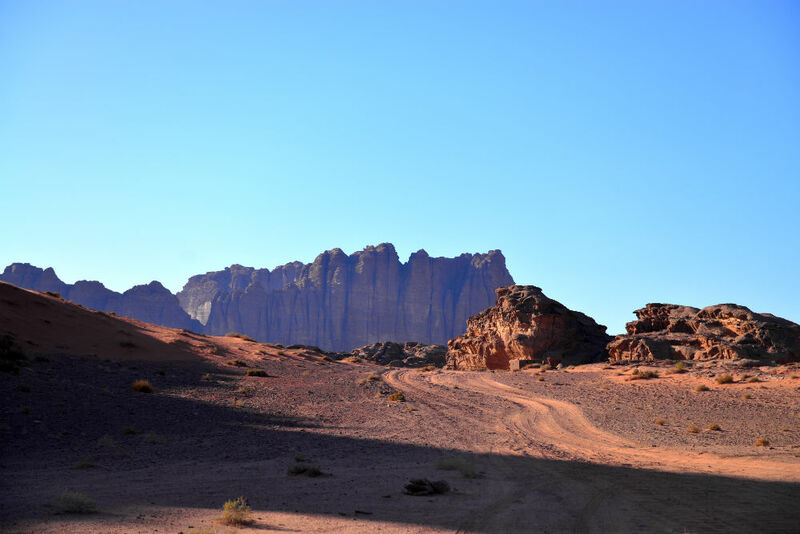 I didn’t know much about the Wadi Rum desert, but there I was, riding in the small, black Peugeot, staring outside the window. 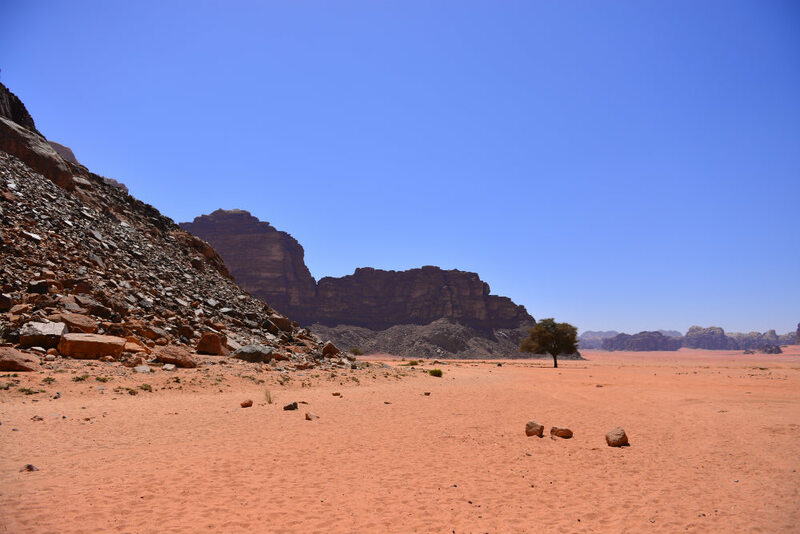 The colorful hills around Petra gradually turned into an endless fields of sand and rock. 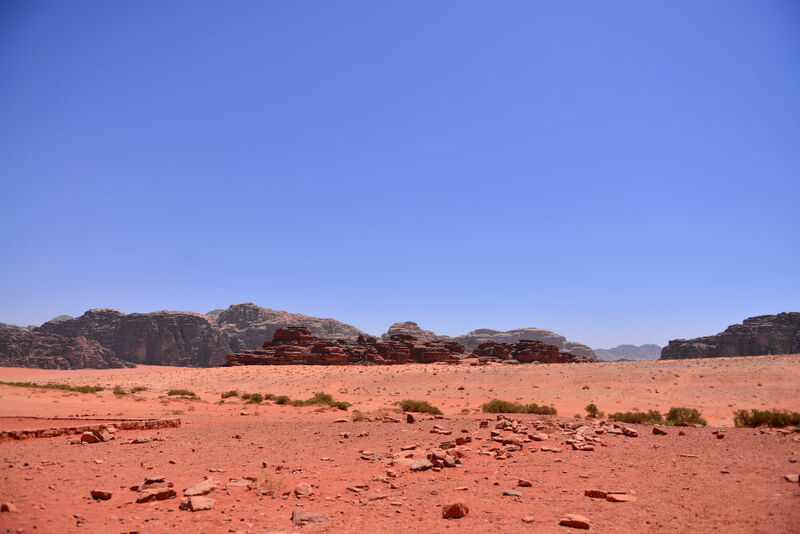 The closer we got to the entrance of the protected area of Wadi Rum, the more drastically the landscape started to change. The plains once again rose, forming a chain of never ending hills with peaks high up in the cloudless sky. The heat was unbearable even for the car. The air conditioning had given up on us few kilometers ago. I was playing with the window button, releasing a burst of hot air every time I opened it. And here I was, standing in the middle of a parking lot, with my tangled hair put up in a ponytail and my sunburnt skin, waiting for my pick up ride to arrive. Few minutes later a open pick up truck stopped near me and I was greeted by the brightest smile I’ve seen in days. 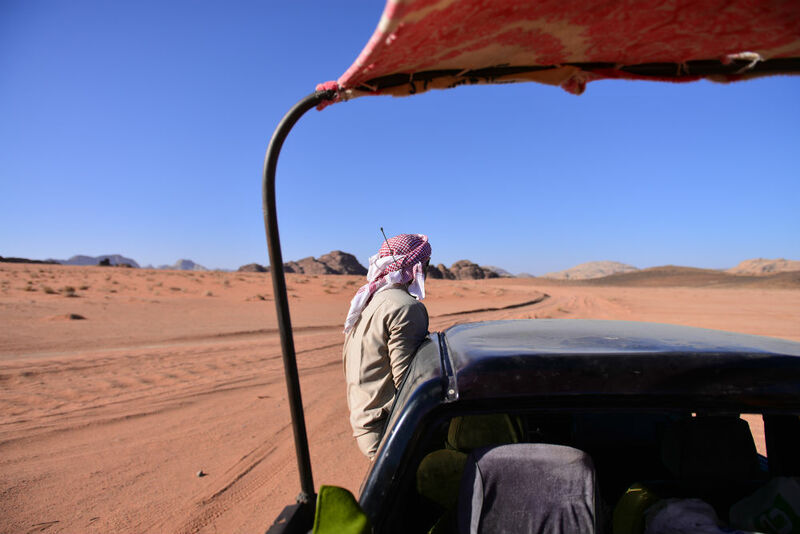 Our journey to the heart of Wadi Rum desert started by driving through the only village that was serving as the gatekeeper between the modern civilization and the old traditions of the bedouins. The further we got from the village, the more surreal the landscape become. 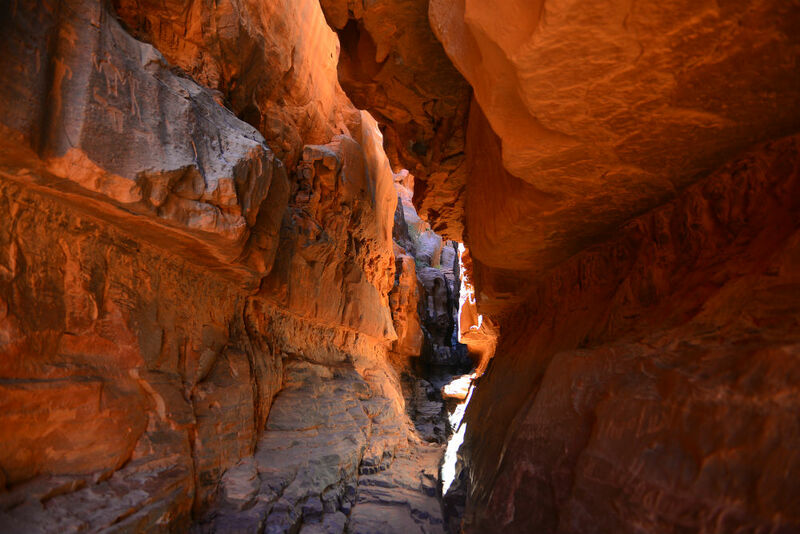 Some of the hills had canyons splitting them right in the middle. Providing shade and gathering water from the few summer rainfalls, the canions also kept stories from hundreds of years. 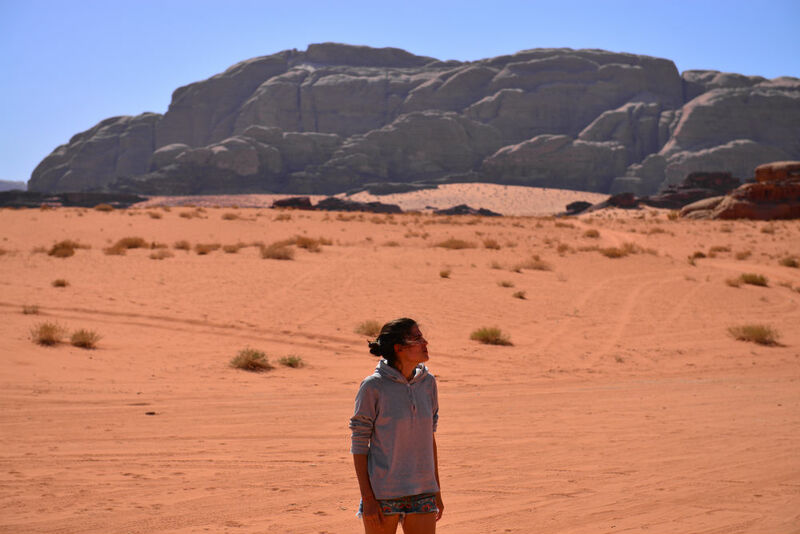 Going from one breathtaking place to another, we managed to cover just a fractions of the vast desert of Wadi Rum. The few hours in the hot desert had taken its toll on us and we stopped for a tasty bedouin lunch, well hidden under the shade of one of the hills. As the sun set, the temperatures started to drop as well. We were approaching the bedouin camp where we were going to stay for the night. Dozens of colourful rugs and a big fireplace made it perfect for telling the stories of big adventures and getting to know the bedouins. A light hearted, genuine and kind people, full of hopes and dreams for a better tomorrow. I opened the tent and wrapped in one of the thick blankets stepped outside. It was cold, but refreshing and I had the view of the whole world in front of me. I just sat there for hours and waited patiently for the sunrise. I knew it was going to bring another promise of great adventures and the beginning of new lifelong memories. This is really very nice way of sharing experience of this amazing place, Thanks for sharing it with us. Such a amazing post you have written. I liked many things in this. You have used amazing creativity. Thanks you that you have shared this with us. Reading this reminds me of my tour of Thar desert.It was my first trip to a desert.It was an exciting trip but the climatic conditions there were so hot and dry. I have heard about this place before but never got chance to read a blog on this. You have portrayed the whole blog marvellously. I would love to visit the place whenever i get the time.